The head of the US Federal Communications Commission defended its historic vote in support of net neutrality, casting the agency as a “referee” for a free and open internet, not a regulator. Speaking at the Mobile World Congress in Barcelona – the largest telecommunications trade show on the globe – FCC Chairman Tom Wheeler maintained that reclassifying internet providers as utilities under the Communications Act will ensure that no company – or government, for that matter – will be able to block or slow down internet services for consumers. However, he dismissed complaints often lodged by internet providers and other data carriers such as Verizon or AT&T, which claim that tighter regulations will stifle innovation and investment by private companies. In fact, Wheeler fought the idea that the FCC’s new rules were even regulations, arguing that they had more in common with the free speech protections enshrined in the First Amendment. “This is no more regulating the internet than the First Amendment regulates free speech in our country,” Wheeler said, as quoted by the Guardian. “If the internet is the most powerful and pervasive platform in the history of the planet, can it exist without a referee? Wheeler pointed to similar regulations that were installed for the wireless industry back in the 1990s, which have since been deemed a success. Meanwhile, he added that concerns over the private sector’s willingness to invest in its networks in an era of net neutrality are overblown, Gigaom reported. 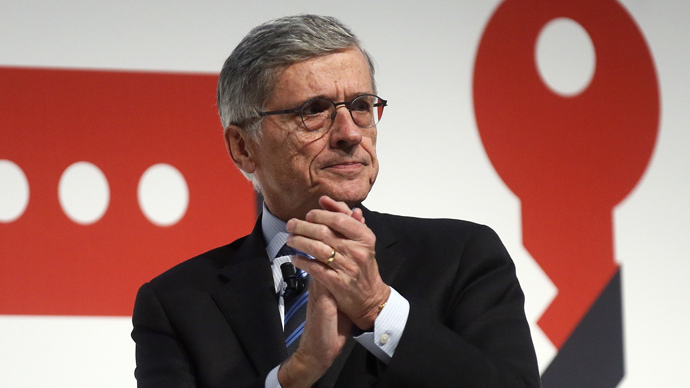 Wheeler said that new open internet rules in 2008 didn’t stop Verizon from spending substantially on 4G spectrum, and even now with the net neutrality vote looming, this year’s 4G auction saw a record $41.3 billion raised. Additionally, the FCC chair said Sprint, T-Mobile and Google Fiber have all said they will keep spending money on improving their networks after the net neutrality rules go into effect. Some telecoms companies continue to insist that they should be able to offer faster speeds for some data, such as heart monitors or internet-enabled vehicles, according to the Guardian. They also believe that offering faster networks should be permissible as long as they don’t obstruct or interfere with “normal” internet speeds. But even though this proposal would not technically slow down internet service for typical consumers, internet advocates have displayed resistance to the idea anyway. Despite the recent FCC vote, Vodafone CEO Vittorio Colao said Wheeler has not come out against specialized services or even fast lanes.